Want to boost your customer base by bringing more foot traffic into your establishment? 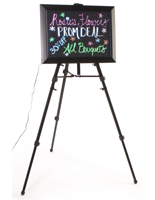 Buy LED writing boards to create captivating advertising with cycled lighting effects and neon colors. Event notices and new drink selections are sure to get noticed in low lit venues with fluorescent menu signs. Want to save space on a showroom floor? Hang LED writing boards in a window or glass surface with simple suction cups, or suspend them from a ceiling using the supplied nylon rope. Wall mounted signs are shipped with compatible screws and anchors. All of our hanging frames are ADA compliant, with a one-inch, low-profile design, and open-face styling. This aluminum framing has a glossy finish in black or mahogany to match any decor. Bar, night club and restaurant owners use flashing write-on signs for promoting live acts and drink specials. Stores and showrooms also use illuminated signage to announce sales and new merchandise. 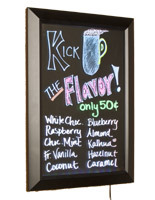 Customize LED writing boards with liquid chalk messages and bring them to life by turning on a switch! What are the advantages of using write-on restaurant signs for advertising? LED writing boards feature bulb-less, light emitting diode technology that is energy efficient and never needs changing! Flashing menu signs have an array of programmable lighting effects for additional visibility in low-lit and dark bars and lounges. Illuminated neon boards have a convenient On/Off button on the side of the units to make it easy to change lighting effects; some units even come with a remote control device. Advertising signage offers wall, ceiling, and floor-mounted options with compatible hardware for easy setup. 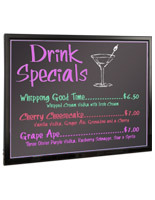 Grow your revenue and customer base using neon menu signs that are easy to customize with liquid chalk and illumination. Each of these sign frames is a great way to personalize advertising messages for casinos, barrooms, hotel lounges, and other businesses that depend on walk-in traffic. 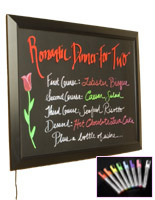 To make changing messages easy, these write-on boards feature a tempered glass surface that is easy to clean. 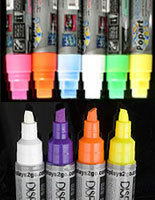 Customize messages with wet-erase markers and liquid chalk in fluorescent and classic colors. These advertising signs are set into a sleek frame with a glossy finish, creating a professional presentation. Easel mounted frames can be placed in the center of a room to ground visitors in the establishment's messaging as soon as they enter. These restaurant signs liven up dimly lit bars and night clubs, but have many other uses. What lighting effects can be achieved using LED restaurant boards? Menu signs have small lights running along the perimeter of the frame producing a glowing backlit effect. Wet-erase boards can be programmed to flash, drawing more attention to the messaging in the frame. Adjust write-on-boards to fade in and out, adding drama to the promotional display. Advanced technology evenly distributes bright light across the surface preventing "hot" and "cold" spots. Never worry that lightbulbs will blow out - diode technology is the primary source of light and bulbs never need changing. 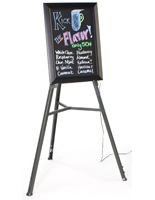 We offer this LED write-on board along with a simple black easel to create a floor standing display. The edge lit flashing signage is also available alone, to be wall mounted or suspended from a ceiling. When placed in a window, this sign board attracts more patrons to your business, especially at night. 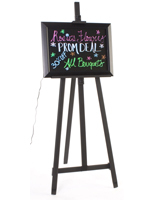 If used in conjunction with an easel as an illuminated floor display, this fluorescent board becomes an effective way to advertise specials and upcoming events. 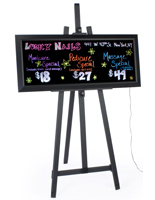 This edgelit message display can boost your customer base and help your business grow. Wet-erase marker signs are often seen in entranceways or hanging in establishment windows. 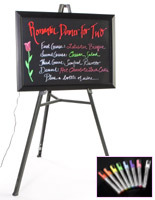 Use this LED writing board to advertise anything from seasonal specials to store promotions. We have hundreds of wall- and ceiling-mounted sign options, as well as easel/sign combinations to choose from. 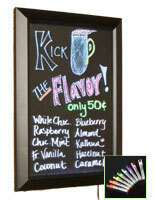 What liquid chalk markers are compatible with these wet-erase menu signs? 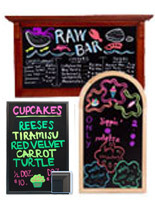 Choose from an array of wet erase markers for liquid chalk boards available in chisel, flat, and bullet tip styles to go with our illuminated whiteboards, blackboards, and lighted write-on boards for dynamic advertising in your establishment. 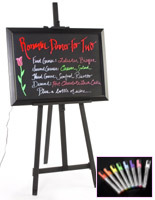 Any type of standard neon liquid chalk writing utensil is compatible with this LED write-on board. We offer a wide range of bright, eye-catching fluorescent bright sticks in electric pink, blue, yellow, orange, and green as well as classic purple, red and black. Use bright white wet-erase marker messaging that pops on a tempered glass surfaces, or tie in messages with the decor using writing tools from our subtle earth tones collection. Please note: never use DRY erase markers on illuminated board surfaces. 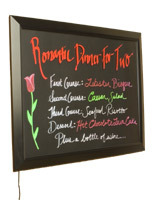 For other types of bar and restaurant signage, shop our full selection of bar and restaurant write-on signs for wall, floor, and tabletop mount, including wet-erase blackboards and whiteboards with illumination, as well as conventional dry erase chalk boards. Most of our signage ships the same day when in stock, and our warehouses are stocked to the gills! For busy venues with a lot of activities going on, like bars, cafes, nightclubs, and stores, buy advertising signage that is easy to customize. No frames to snap open, or inserts to replace, our advertising signage requires only a writing tool and eraser, and somebody who has nice hand writing! 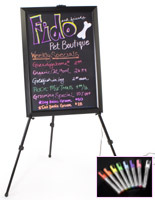 Promote events, new merchandise, sales and specials, and more using lighted wet erase boards designed to draw attention to your most important notices and announcements.